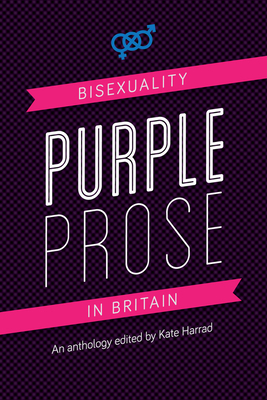 Purple Prose: Bisexuality in Britain is the first of its kind: a book written for and by bisexuals in the UK. This accessible collection of interviews, essays, poems and commentary explores topics such as definitions of bisexuality, intersections of bisexuality with other identities, stereotypes and biphobia, being bisexual at work, teenage bisexuality and bisexuality through the years, the media’s approach to bisexual celebrities, and fictional bisexual characters. Filled with raw, honest, first-person accounts as well as comments from leading bisexual activists in the UK, this is the book you’ll buy for your friend who’s just come out to you as bi-curious, or for your parents who think your bisexuality is weird or a phase, or for yourself, because you know you’re bi but you don’t know where to go or what to do about it. Kate Harrad is a published fiction and non-fiction writer. She has over a decade of experience working in business editorial/writing positions, and has written for the Guardian, The F-Word and the Huffington Post. She is also a longtime bi activist and has co-organized numerous UK bisexuality events.